GYMC’s Gala Evening promises to be its most entertaining fundraiser ever! 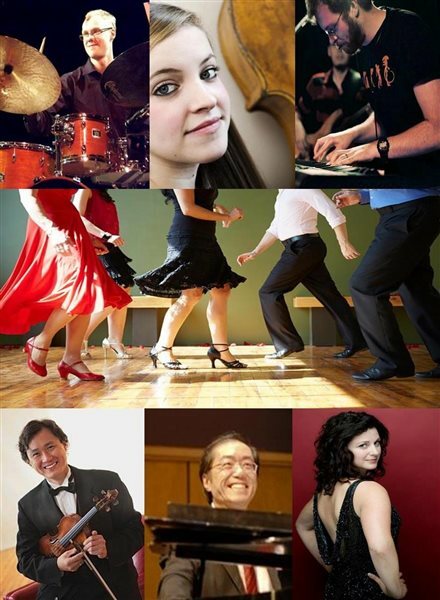 After over a year’s absence, the Guelph Youth Music Centre’s gala evening "Bella Serata" (beautiful evening) returns on Saturday June 23 at 7 pm with the theme "We Could Have Danced All Night!" The best features of past galas are included - wonderful food by some of the area’s finest restaurants and caterers, delectable desserts, wine, beer and other beverages, an exceptional Silent Auction, plus Classical music performances in the stunning acoustics of the Recital Hall. New to Bella Serata is exceptional jazz by the Nick Maclean Trio which includes Tyler Goertzen on drums, Lauren Falls: Bassist and Composer, and Nick Maclean - Pianist/Synthist, plus a demonstration and group lesson by professional ballroom dance teachers from http://www.ballroomclass.ca/ , offering the chance to dance to live music by the jazz trio. Award-winning pianist, Nick Maclean has been deemed one of the most gifted young Toronto pianists to come along in recent years. Maclean received his Bachelor of Music from Humber College in 2013 and went on to do his Masters in Jazz Performance at the University of Toronto researching synthesizer pedagogy. He leads the hard-swinging NYC-style jazz ensemble The Nick Maclean Quartet, which was formed in 2016. Classical music performances will feature "Concorde" (the senior string ensemble of the Suzuki String School of Guelph, founding resident organization of the GYMC), Toronto violinist Tak Kwan (http://takkwan.com concert performer and director of the GYMC’s orchestra programs), renowned soprano Marion Samuel-Stevens-Soprano, and, pianist Ken Gee (about ken gee , artistic director of Guelph Musicfest). 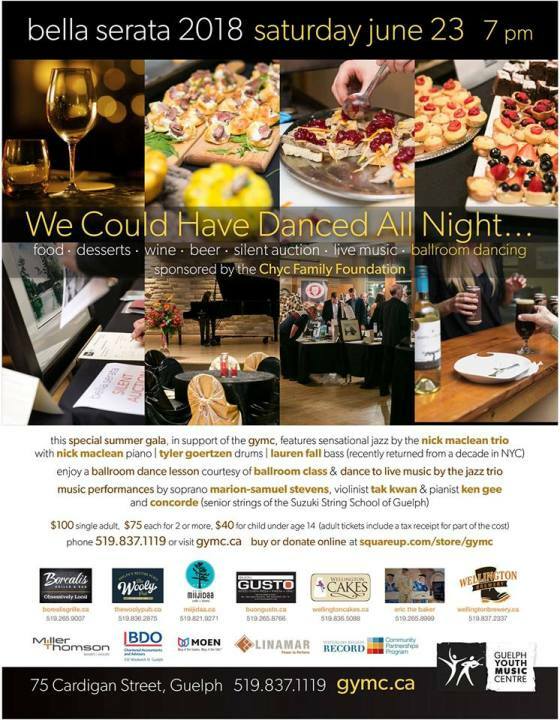 Food and wine vendors are: Miijidaa Café & Bistro, The Wooly, Borealis Grille & Bar (Guelph), Buon Gusto, Cassoulet Catering, Wellington Cakes, Eric the Baker, Red Brick Café, Wellington Brewery, and, Vineland Estates Winery. This year’s gala is generously sponsored by the Chyc Family Foundation. The event is also generously supported by Miller Thomson Lawyers, BDO Chartered Accountants, Moen Canada, LINAMAR, Guelph Mercury Tribune and Waterloo Region Record. Established in 1992, the GYMC is a not-for-profit organization dedicated to education, enrichment and fostering the development of youth through music and the arts. The unique facility officially opened its doors in September 2001 after six years of renovations. The GYMC is an exciting cultural hub for children of all ages and backgrounds in the community. Through a variety of programs, provision of space to partner organizations and outreach into the community, the GYMC enriches many lives. For more information visit www.gymc.ca or call 519.837.1119.